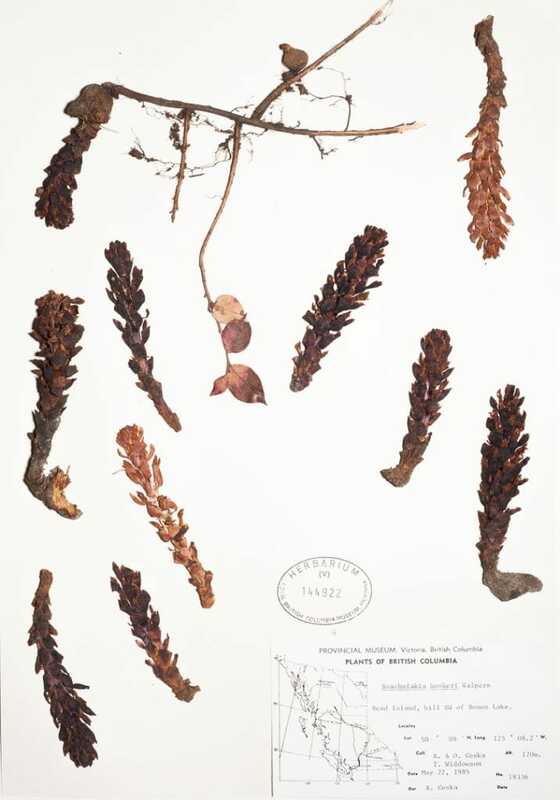 The Royal BC Museum botany collection consists of more than 215,000 dried plant specimens housed in our herbarium, including 208,000 vascular plants, 7,000 mosses and lichens, and 450 boxed cones. Our collection includes specimens of most vascular plants native to BC, and many that have become naturalized. Many species are represented by collections from the 1890’s. We have about 70 ‘type’ specimens, each of which was used in the original published description of a new species or subspecies, as required by international standards. The botany collection is one of the two largest reference collections of BC plants in the world and is frequently visited by researchers, consultants, government biologists, students, and interested members of the public. Our specimens and the information on their labels are used to improve species and habitat descriptions, to compare past and present geographic ranges of species, and to document the occurrence of species of conservation concern. Occasionally, we grant permission to researchers to remove plant parts for comparative anatomical, morphological or molecular phylogenetic studies. 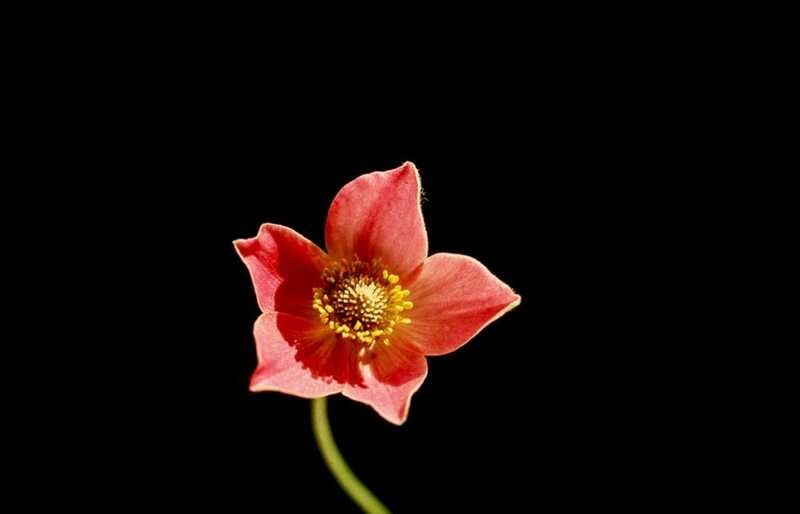 We frequently loan specimens to experts studying particular groups of plants. 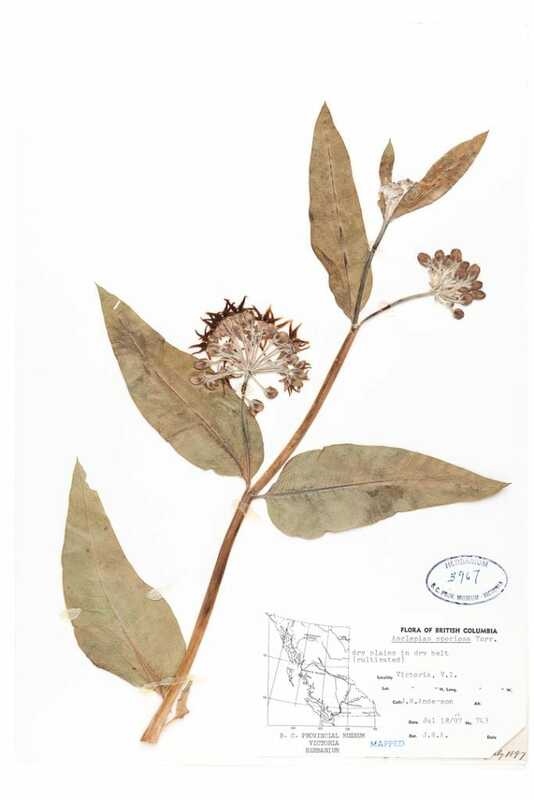 In addition, we distribute duplicate specimens from our collection to other herbaria in Canada and around the world. Regions of the province that can be easily accessed by road have been frequently visited by botanists over the last century, and are relatively well-represented in our collection. These regions include the southeast quarter of BC, the Alaska Highway corridor, Vancouver Island, and National and Provincial Parks. Much of the northern two thirds of the province and the mainland coast are difficult to access and we have fewer specimens from these areas. Northern BC alpine habitats are increasing in representation as the result of annual museum collecting trips since 2002. Taxonomic strengths include species of the sedge, sunflower and grass families. Museum staff strive to strengthen the botany collection at the RBCM by targeting regions and habitats in the province from which few collections have been made. We annually accept close to 1000 specimens donated by government biologists, consultants and the general public. 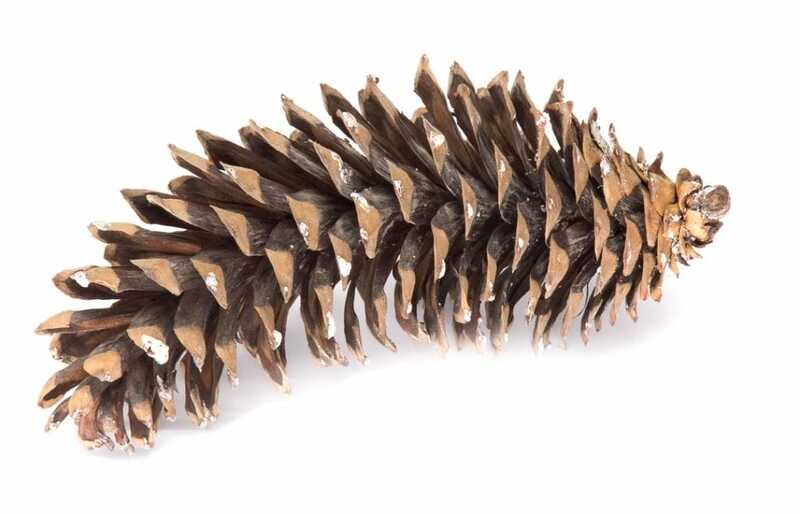 We will gladly accept specimens collected in BC and adjoining provinces and states that document range extensions, unusual morphological forms, the flora of under-represented regions and the spread of invasive species. Museum staff collections:Since 2002, annual field trips to northern BC alpine habitats have added approximately 11,000 specimens, primarily from remote areas that have not been previously visited by botanists. In 2005, 350 specimens were collected from lower elevations on the large coastal islands south of Prince Rupert. 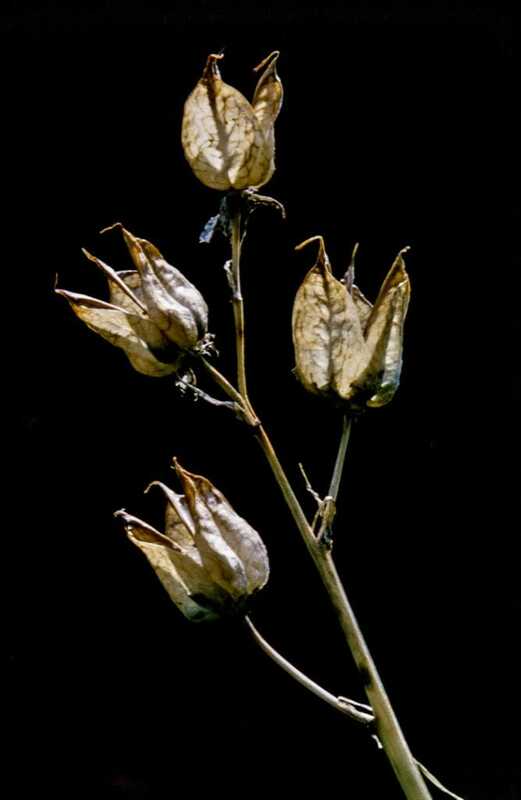 In 2007, approximately 800 specimens of non-native plants were collected from southern Vancouver Island, a project funded by Environment Canada. In 2010 and 2011, collections of approximately 30 species were made from two areas in Russia for a phylogeographical study of arctic and alpine species. In 2012, collections were also made in Alaska for this study. 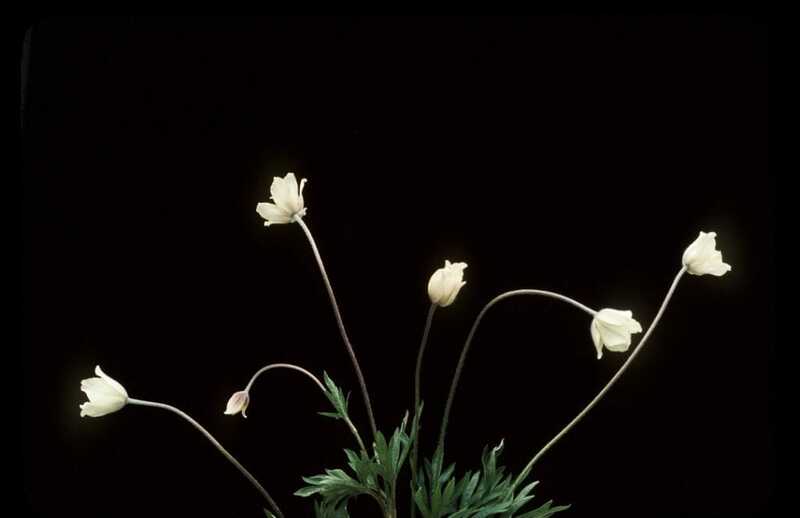 Other collectors: Significant collection development has occurred through donations from the BC Conservation Data Centre (CDC) and other government ministries, consultants and amateur botanists. 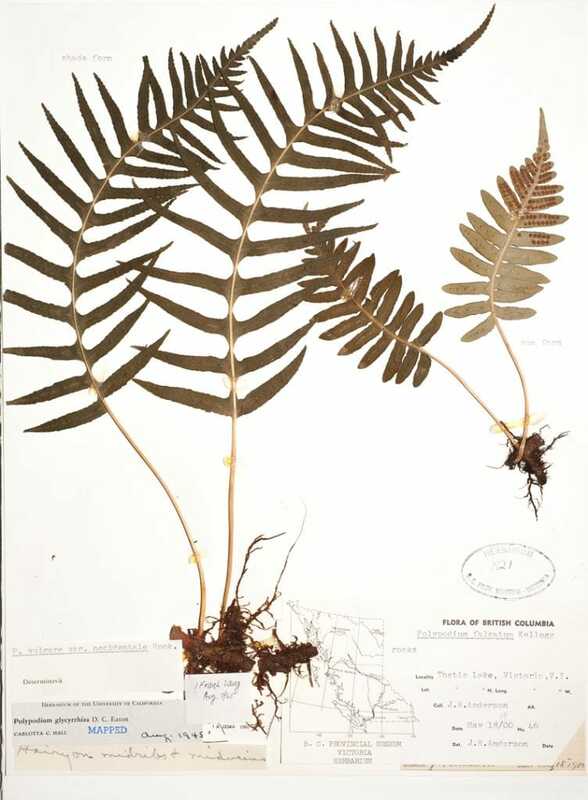 Duplicates from other herbaria: We receive duplicate specimens from other herbaria in Canada, the US including national collections in Ottawa (CAN, DAO), the Yukon Territory (BABY), the University of British Columbia (UBC), the University of Washington (WTU), and the University of Colorado (CU). Our botanists continue to collect plants in northern BC alpine habitats since this has been identified as a gap in our collections. Other geographic gaps include the Coast Mountains, coastal islands, and the Rockies in northern BC. We continue to accept collections that document significant range extensions, species that are new to BC and the spread of invasive species. All collections are useful in understanding the biodiversity of the Province of British Columbia. If a particular accession has more material than needed for the Royal BC Museum collection, duplicates will be sent to UBC, the Canadian Museum of Nature or the Burke Museum (University of Washington). Collections from northern BC alpine have yielded several significant range extensions; these specimens and others already in the collection are being used to write publications regarding their significance. During field trips we are collecting tissue and voucher specimens of taxa that are being used to study the biogeography of BC’s alpine regions using DNA analysis. 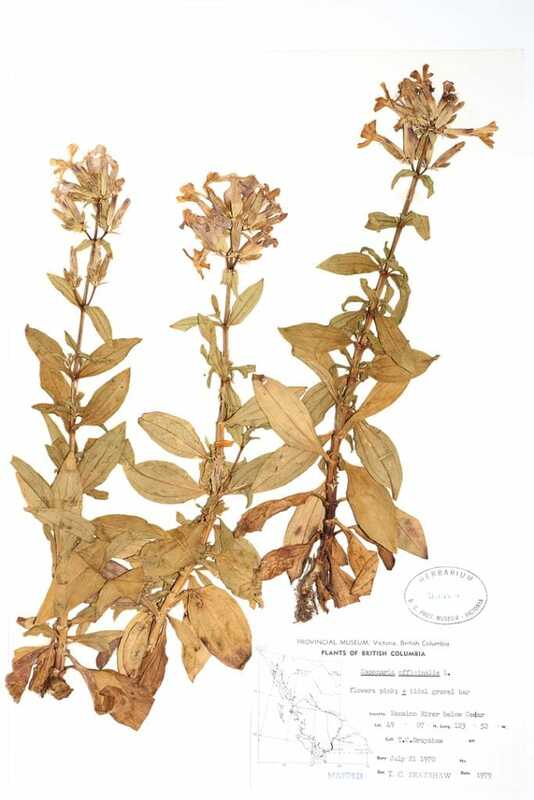 In order to accept a donation to the botany collection, we look for good specimen quality (this usually means that flowers/fruits are present); accurate collection location; representation of rare taxa; and collections from regions that Royal BC Museum staff aren’t likely to be able to visit in the foreseeable future. Most have been identified and have labels, and some are mounted. We endeavour to verify the identifications of specimens before they are admitted into the collection, but this is not always possible. We reject specimens that are poor, that come with inadequate collection information, or are of species that are already well-represented in the collection. Researchers are welcome to examine the collections by contacting the appropriate curator and making arrangements with the collections manager. Please give as much notice as possible. You may contact museum staff by e-mail, letter, or phone. We will want to know the expected dates of your visit, the specimens you want to examine, and your equipment needs (e.g. microscope). Collection access is between 9:00 AM and 4:30 PM, Monday to Friday, unless otherwise arranged. Requests for loans of specimens can be made through the curator or the collections manager.